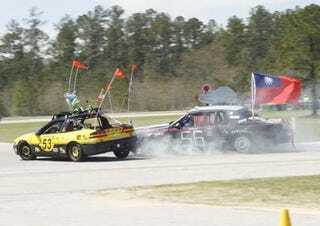 24 Hours Of LeMons Hits South Carolina Next Weekend, Mark Sanford Penalty Ready To Go! When you get Southerners and $500 race cars together, great things happen! In my opinion, LeMons South is the most fun of all the 24 Hours Of LeMons events. We've got two Fiat 124s showing up, in order to do battle with the two Alfa Romeo Milanos, so there ought to be an all-Italian race-within-a-race going on. I'll be performing my judgely duties in style, thanks to the Roadmaster Mobile Justice Unit, and I'll do my best to keep the live updates coming. Let's hope I don't get a case of the Jake Leg from that moonshine! As for the special Mark Sanford penalty, it involves the flag of Argentina and a love letter. Need we say more? Here Comes Da Judges: Meet The Roadmaster Mobile LeMons Justice Unit!